Emerging franchise LemonShark Poke´ is surging on to the national scene with a winning restaurant blueprint for expansion as a premium brand with staying power. 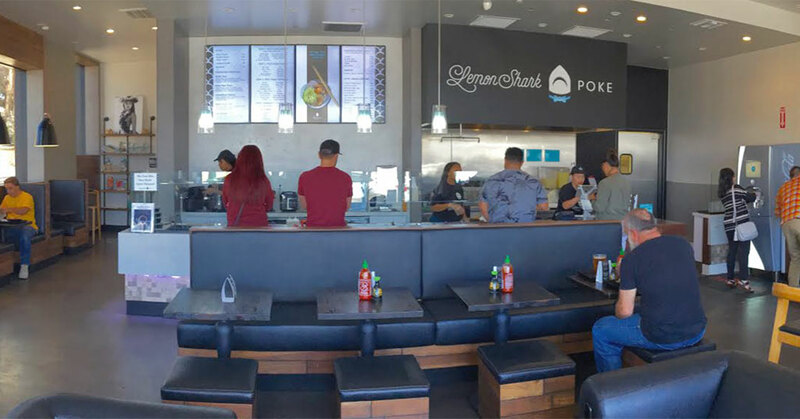 With six restaurants in California and Florida and as many as 25 locations set to open in 2018, LemonShark is the fastest growing poke concept in the U.S. The brand, serving up fresh, locally sourced and crafted poke in an upscale setting, has already inked 90-plus franchise licenses with 25 groups and is closing in on a mega development plan with multi-brand franchisee Andres Garcia. The agreement, under the umbrella of Garcia’s Pompano Beach, Florida-based JAE Restaurant Group, calls for the development of 100 LemonShark restaurants over the next five years, notes Tobi Miller, president and chief operating officer of LemonShark, which launched franchising in 2017. This flurry of multi-unit franchise deals with seasoned operators has paved the way for the “fine casual” brand to hit the road to nationwide growth with experience. “We are only selling multiple units to people already entrenched in retail franchising,” says Miller, who founded LemonShark in 2016 with partner and childhood friend, Richard Gottleib, who serves as board chairman. There is a lot to love about LemonShark Poke´, the California-based brand, named after the Hawaiian native shark known as a powerful, discerning feeder. The colorful brand has equally interesting and strong leadership in Miller, a founding member and lead guitarist in the ‘90s rock band The Wallflowers, and Gottlieb, a former pro race-car driver, whose legendary Big Red Camaro boasts its own fan following. Friends since third grade, Miller often joined Gottlieb on their annual family vacations to the Aloha State, where they were poke devotees long before the traditional raw fish salad dish became one of the nation’s hottest food trends. “We have a deep love and a history for the food,” remarks Miller. Along with a passion for poke, Miller and Gottleib are successful real estate developers who bring extensive know-how to the brand. The franchise is focused on securing the best terms, at the right price, in prime locations, says Miller, who is committed to visiting each prospective LemonShark site before a lease is signed. Unlike most poke concepts, with a Subway-type layout of 1,000 to 1,200 square feet, LemonShark’s “sweet spot” ranges from 1,500 to 2,400 square feet in size, notes Miller. The brand offers two franchise options: food court/kiosk models and larger in-line restaurants with “really nice interior build outs,” featuring a subtle combination of Hawaiian and Japanese elements for a clean, contemporary look, Miller says. Miller, who also brings the franchise partner perspective to the brand as a veteran Yogurtland franchisee, says LemonShark has assembled a hefty corporate team of more than 50 restaurant and real estate industry pros to ensure strong franchisor support from the start.